Whilst working on The Flint Street Nativity (our forthcoming Christmas production that opens in just over two weeks). I came across an interesting article by the playwright Tim Firth about how he came to write the piece. Well worth a read. Come Christmas there are always those cynics who decry infant nativities as pointless charades, championed only by hypocrites seeking to inoculate themselves against hedonism with a brief intravenous of 'meaning'. What lessons, they ask, are to be learned in the modern age from plodding formation of a tableaux by kids trying to work out what a 'virgin's womb' is and how not to 'abhor' it. The answer is 'numerous and trenchant' lessons for all concerned; not in the table itself but rather in the telling. For time-starved teachers at the end of term, the casting of a nativity is an object lesson in social engineering and appeasement. In the darkest vaults of each infant school is an unspoken template which can be slapped on any class register: MARY - give it to the girl whose parents are the most trouble. JOSEPH - the docile bay who is happy being led round like a Victorian orphan but would protest at being the donkey. DONKEY - give it to the kid who doesn't mind being a donkey. (There is always one of these and chances are they will achieve the greatest happiness in later life). GABRIEL - give it to the girl who could've been Mary but whose parents were less trouble. SHEPHERDS - any child who won't go on without their best friend. WISE MEN - any child who won't go on without their best friend but can also be trusted to carry out a simple motor function when glared at. STAR OF BETHLEHEM - save this for the child is odds-on to back out at the last minute. No-one misses the star. NARRATORS - these are your Corinthian pillars. Choose wisely or, best, get the NNEB to read the part in. During my research for The Flint Street Nativity, teachers divulged more than one occasion of mums asking staff to share out the Mary role, suggesting they alternate Marys between matinee and evening performance and in one case during the course of the show. Having adults play children in a comedy built around the direct results of such mentalities was my attempt to portray how the membrane separating the world of adults from that of children is never thinner that during a nativity. On stage, children act like adults whilst in the audience adults see with infantile jealousies. In a world where school football touchlines are peppered with proto-Mourinhos bawling out refs for not helping their kids side win, and where parents swap schools at the first whiff of negative comment it's a refreshing slap in the face to know there is, and will only ever be, one Mary. The children play adults, but it is the adults who are forced to grow up. The stinging lesson learned first-hand by children prepares them for one of the toughest issues they will ever have to face in adulthood. which is this: the part you end up in life with may not be the part you feel you deserve. The dock leaf to the sting, however, is that very often what you thought to be the best part turns out not to be so. When I was four I was taken to the nativity at my future infant school. Could I tell you now one thing about Mary or Joseph> No chance. Do I still remember the donkey turning to one side halfway through and shouting from inside his head:" BLOODY HELL MISSIS QUIRK IT'S HOT IN HERE"? Killer line at the right time and you will steal the show/board meeting/political summit. The following year, now an infant, I felt I was a shoe-in for the part of Joseph following a very promising (ie loud) recitation about our sheepdog. Tragically loomed in the form of a school teacher on secondment. He took over the nativity and reset it amongst kids who were 'in the neighbourhood of Bethlehem at the time'. Now this was in the days before social inclusion had seen a marked rise in secular nativities along the 'Reindeer Who Got Lost' line. Not only did this trendy angle totally nuke the part of Joseph, but it meant that I no longer stood a chance of holding the hand of Mary, a babe who fancied my best mate. Consumed with injustice, during the holiday I wrote my first three-minute play for assembly. In short, I owe the whole idea of my ever becoming a playwright to the nativity, not out of any desire for self-expression but rather out of desire for a girl and her cardigan, sweet with Lenor. I cast myself as the handsome prince, Mary as the princess and my best mate as the arse end of the dragon. Tickets are flying out of the stable door for this production so be sure not to miss out! 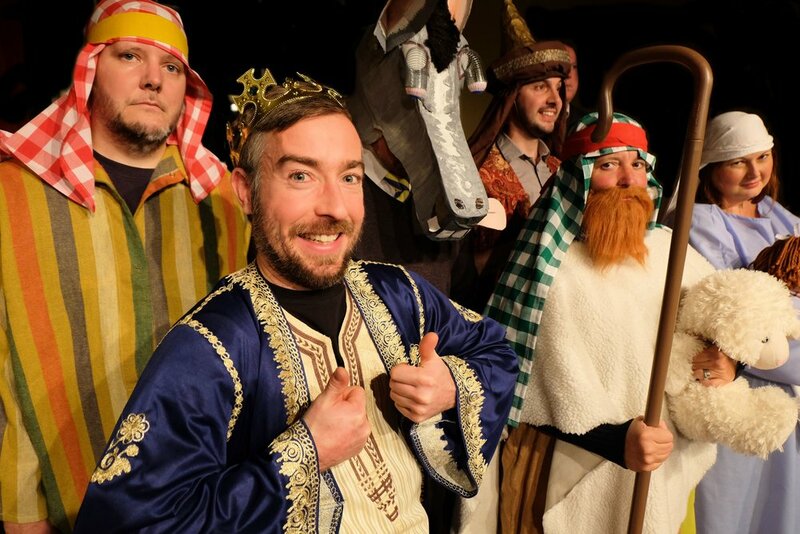 The Flint Street Nativity is on at the Lamb Theatre in Eastbourne’s Old Town, tickets left for 3 performances only: Dec 2nd, 7th and 8th Click here for more information and to book tickets.